Italy is divided into 20 regions. Each region is divided into provinces, and each province is divided into municipalities. These are ancient divisions of geopolitical areas, each connected with unique local customs and culture. Take a tour of each region and if you pay attention it would be like taking a trip to 20 different countries. Why plan a trip by region? You'll hear a lot about the regions of Italy when you plan a trip. Cuisine and many other customs in Italy, tend to be regional, so you'll hear of "Cucina Toscana" when you travel to Florence, for example. The history of conquest and settlement gives each Italian region a particular cultural flavor that comes out in the cuisine, art, and architecture of the place. Tuscany is the classic region for una Fiorentina, the Florentine T-Bone from Chianina beef cooked over a hardwood fire. There's also lots of seafood along the Tuscan Coast, but Puglia has always been the place to sit down and eat nothing but the small plates from the sea, followed up by a grilled fish if you're still hungry. Piemonte has great wine and over 160 cheeses and is Italy's herb producer. The Emilia Romagna is Italy's culinary capital and the place for great eggy pasta and meat, perhaps some tagliatelle Bolognese from the region's food capital Bologna, followed by a bollito misto. The Italian islands are also great for fish, but Sardinia is very much a meat-eater's dream. Try the spit-roasted suckling pig maialino, and any lamb dishes you might come across. 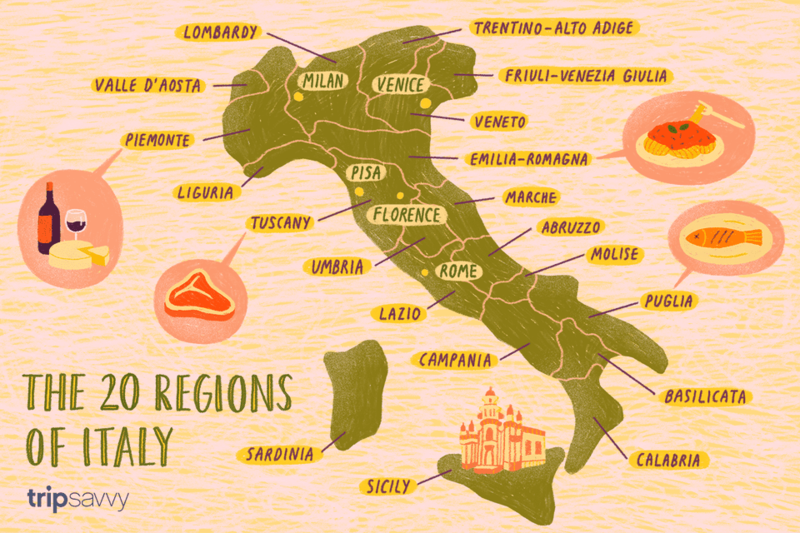 Italy's northern regions prefer butter, while the center and south have relied on olive oil to cook and flavor food. Lots of travelers like the Renaissance art and architecture of Tuscany, but the Renaissance didn't reach the south of Italy. Instead, the compelling regions for the expression of the Baroque are Puglia and Sicily. Lecce is singled out as a Baroque city, but let's not forget about Ragusa and the other cities of the Val di Noto in Sicily. The region of Puglia is also singled out as being one of the flatter regions of Italy, so biking, for those of us who don't relish long hill climbs, is a great activity to plan for the heel of Italy's boot. Looking for the way-off-the-beaten-track tourist destination? Travel to Basilicata, it's very rural. Tourist favorite Matera is there, but there's even more eye candy at an abandoned town filmmakers can't seem to keep their light meters away from: Craco. If you need more to kick-start your Basilicata travel planning you might ask Francis Ford Coppola, who decided to build a luxury hotel in the unknown town of Bernalda. Now it's a swingin' place. If you're in Tuscany, Italy's largest region, you might want to get away from it all in the historic territory known as La Lunigiana. The food is fantastic, the churches are Romanesque, and life is good (and inexpensive).